Getting a tattoo is a big deal! This is something that you’ve probably thought about for a while and now that you’ve finally made a decision you’re happy with, you’re ready to schedule an appointment to get your tattoo done. Getting a tattoo is also incredibly exciting. Sure, you might be nervous at first – especially if you’re a newbie at getting tattoos, or if you’re afraid of needles — but you know that once all the pain is over, you’ll have a beautiful piece of art on your body that you can show off to all of your friends and family. Of course, before you can go through all of that, you need to actually decide on a design first. And THAT process can take a long time if you’re indecisive. When you have a meaningful or symbolic tattoo in mind, it can make it a little easier to make up your mind and go through with the tattoo process. Like zodiac sign tattoos. 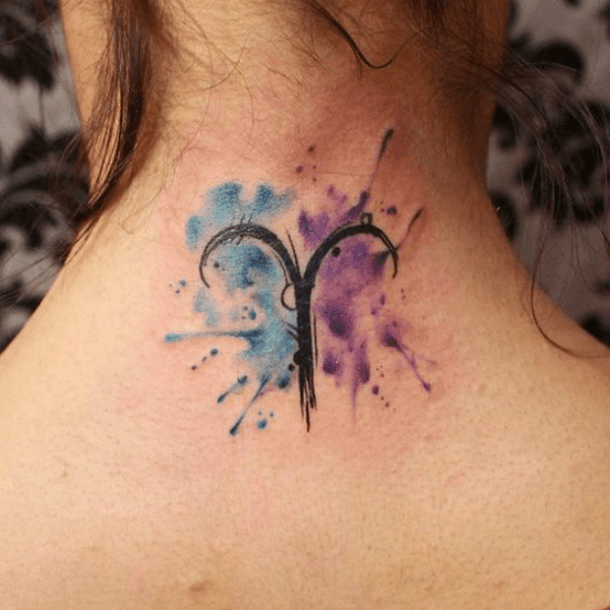 Your zodiac sign is something that’s special to who you are and you know that getting a tattoo of your zodiac sign is something you’re ready for. 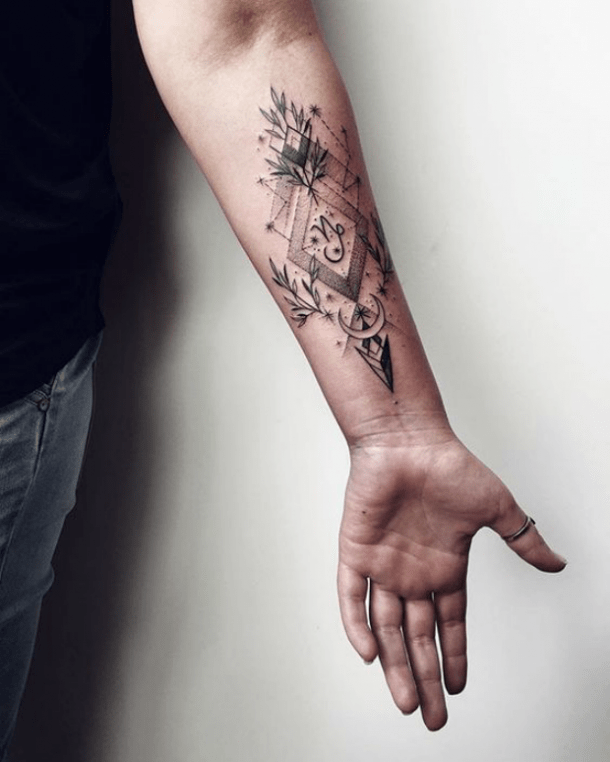 Of course, as a Capricorn, you’re not exactly the spontaneous person who can just say they want a tattoo and go for it – not without some serious planning first, that is. 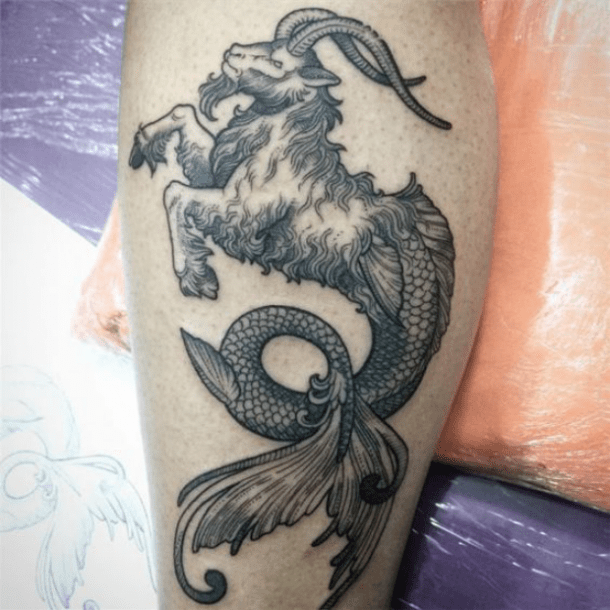 But when you do commit to the tattoo you want to get to represent the amazingly weird and eye-catching sea goat that is Capricorn, everything seems to fall in place. Heck, you probably already read up on which tattoo shop is the best one to go to and how to take care of your tattoo afterward. Good for you! Everyone should be as prepared as you are to get a tattoo. But right now is the hard part – choosing a design. Do you go with something big and colorful or something tiny and simple? That choice is all up to you, Capricorn! 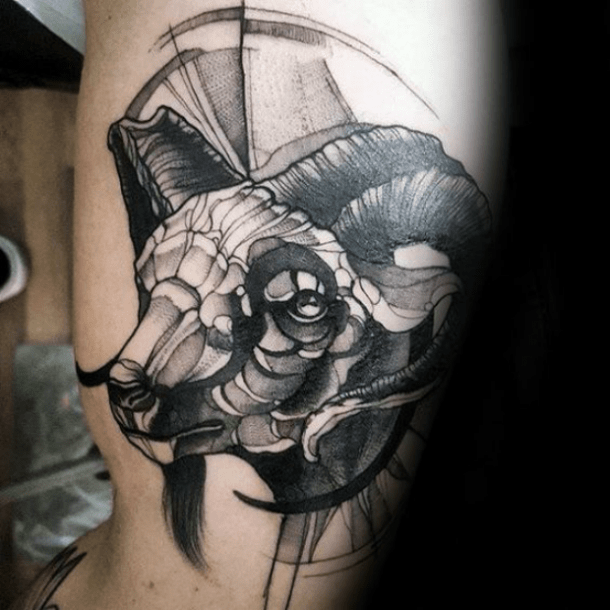 And to help you decide, here are 25 of the best Capricorn zodiac tattoos; all unique, but all perfect for you. 1. A modern take on a simple tattoo. 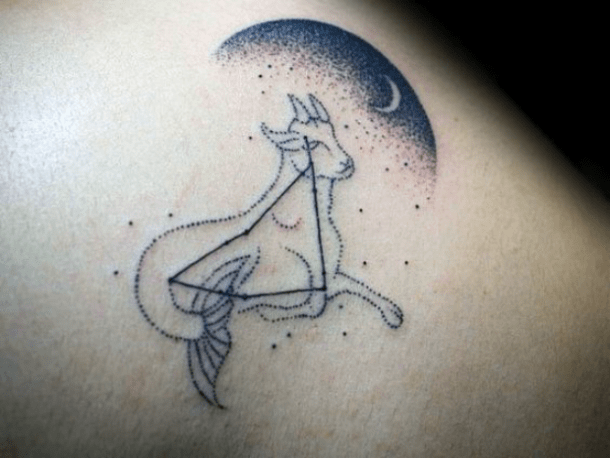 All you need for your Capricorn-inspired tattoo is the outline of a goat (or sea goat). After that, you can get as creative as you want, like this tattoo with an ornate design. 2. Now THAT's what I call an eye-catching tattoo! This tattoo is everything and a bag of chips. 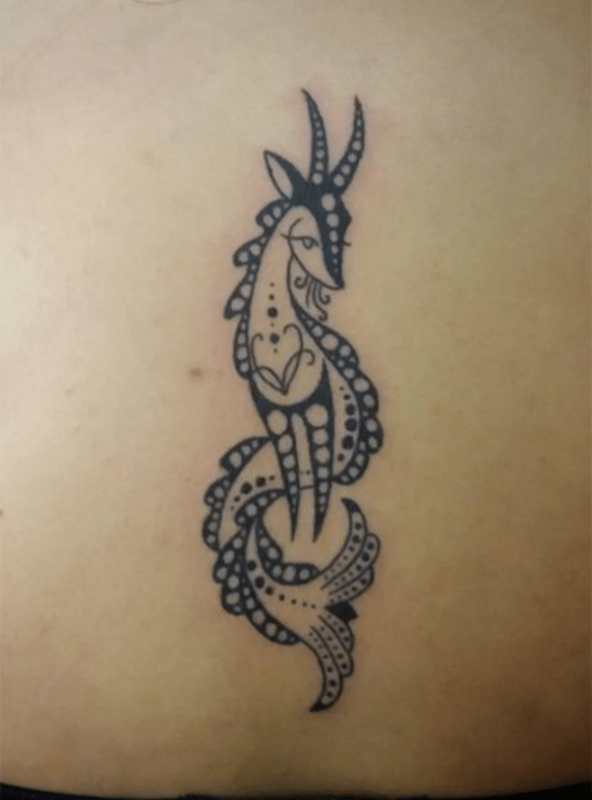 The Capricorn sea goat is so unique and interesting that you can't help but get a tattoo that shows the animal off in all its glory. 3. Something a little different for the creative type. 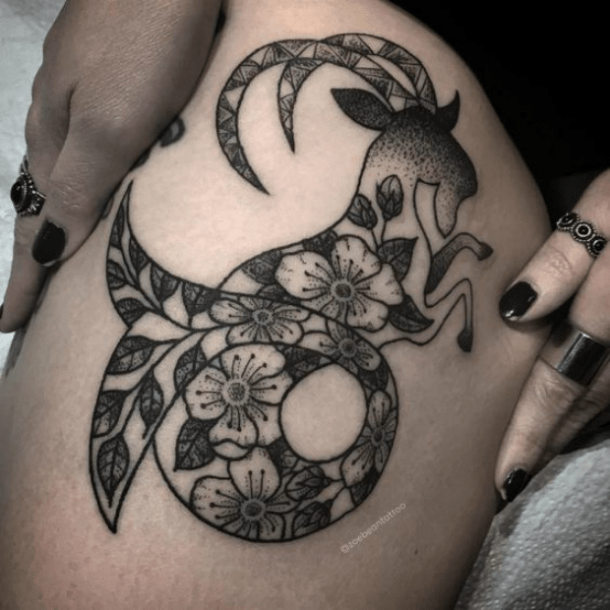 Like I said, all you need is the outline of a goat to symbolize the Capricorn zodiac sign — after that, you can do something interesting like this; an outdoor scene or something else that means a lot to you. 4. A creative take on the Capricorn symbol. 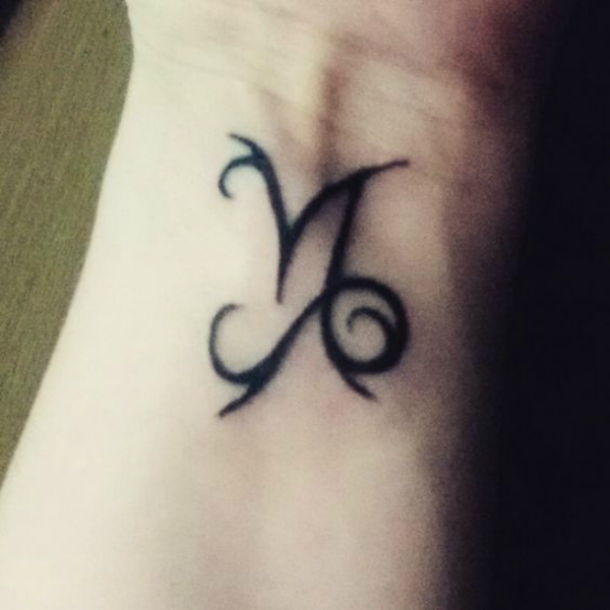 This tattoo doesn't look like the Capricorn symbol on first glance, but it's certainly beautiful! 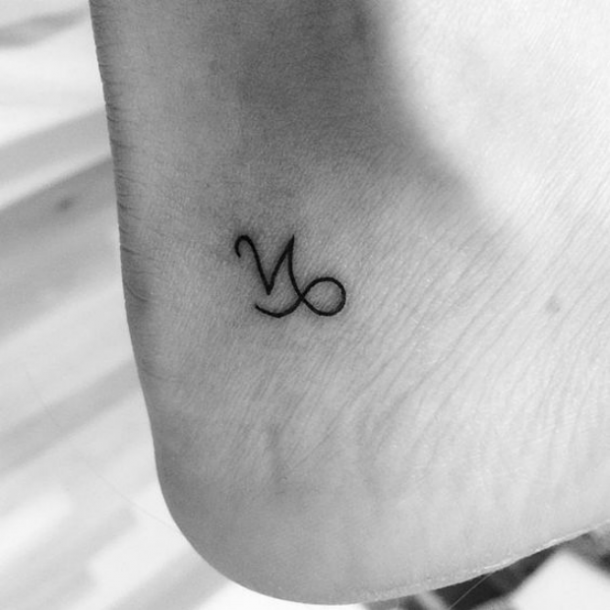 It's almost like a paint brush or an ink pen was used to draw this zodiac sign symbol — I love it! 5. 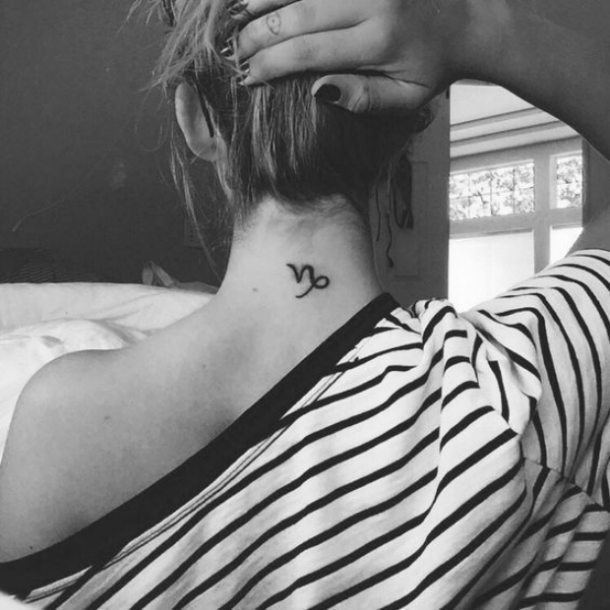 Just because you want a Capricorn symbol tattoo, doesn't mean it has to be simple! 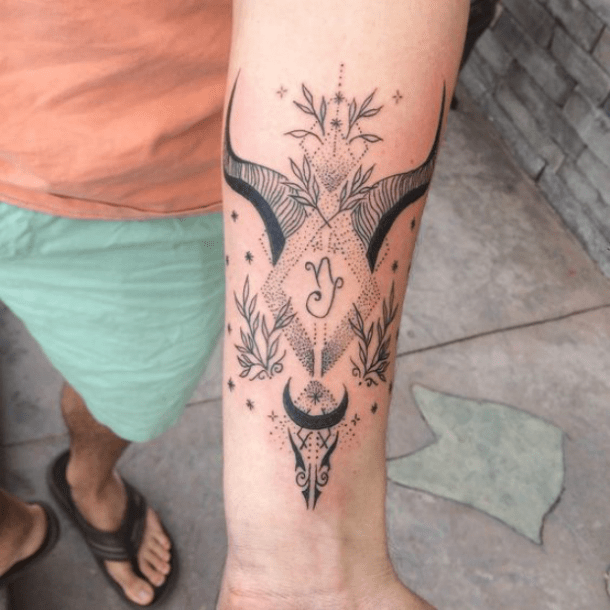 I like this tattoo a lot because the Capricorn symbol is the main focus, but there's also a beautiful geometric design around the symbol for added flair. 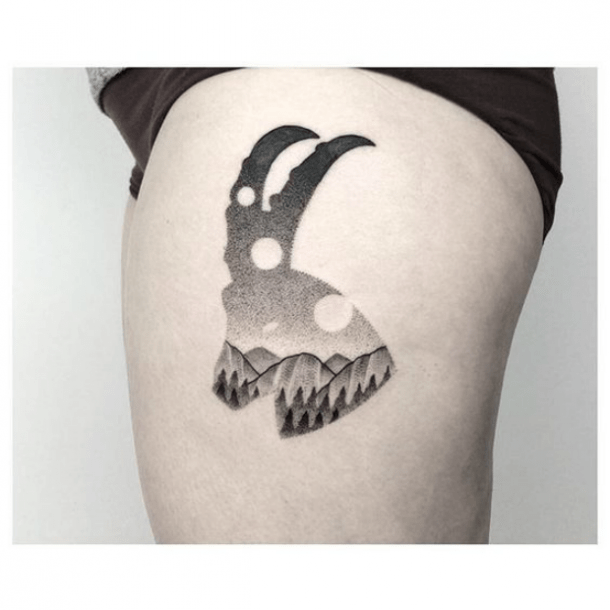 If you're a fan of geometric patterns, you can get a tattoo of a modern version of the sea goat with different shapes and patterns throughout the design. 7. Something ornate for the person who wants to show off their tattoo. This tattoo is stunning, in my opinion. You've got some flowers, a nice background, and a very pretty goat head right in the middle. If this tattoo doesn't scream "look at me!" then nothing will. 8. A Capricorn symbol that's anything but simple. 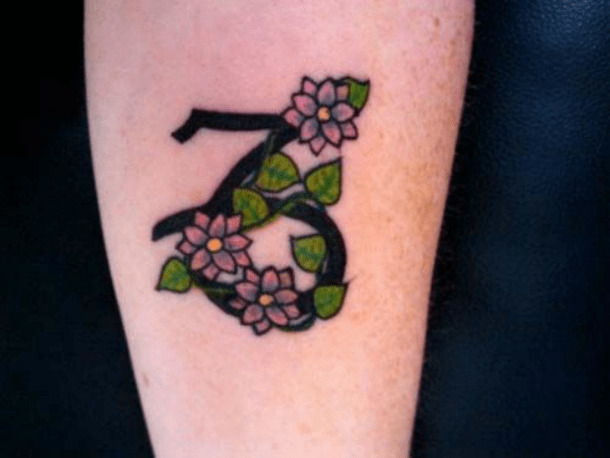 Oh, you thought this was a simple zodiac symbol tattoo? Well, you were wrong! Notice the little flairs on the ends of the symbol? That's what gives this tattoo a little something extra. 9. A realistic rendering of the Capricorn sea goat. If you want something a little more realistic and a little less fantasy-like, this is the sea goat tattoo for you. A real goat on top and a real fish tail on the bottom make for a very nice pair. 10. Or maybe you'd rather do something fantasy-like. If you want to embrace the fantasy that the sea goat embodies, then you might as well go all out. Pretty colors, a goat wearing some jewelry — how more fantastic can you get?! 11. 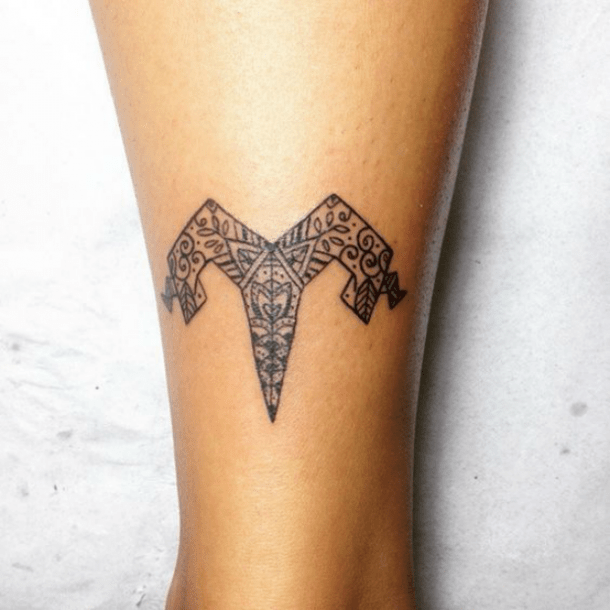 Another detailed Capricorn symbol tattoo. You've got the Capricorn symbol right in the middle, some goat horns on top, and gorgeous detailing around the whole thing to tie it all together. Love it! 12. Are you more of a minimalist? Then look no further! 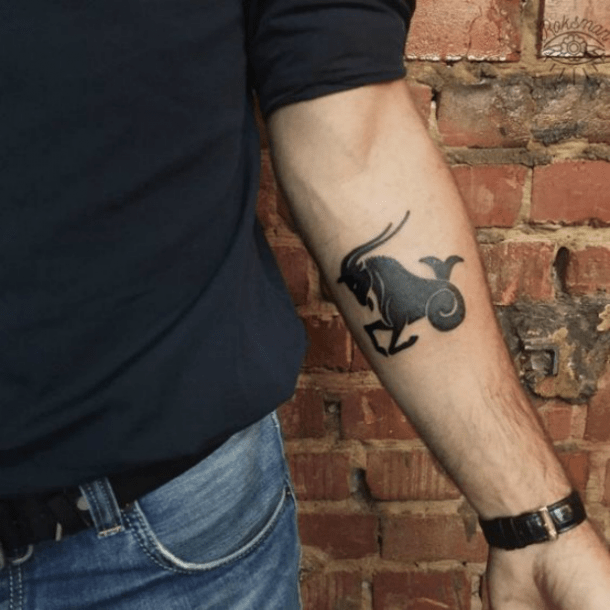 I've always been a fan of minimalist tattoos and this simple Capricorn symbol is perfect if you want a tattoo to symbolize your zodiac sign, but want to keep things simple. 13. Here's an interesting take on the sea goat. This looks more like a sea deer (or a very pretty goat) than an actual sea goat, but hey, no one says you have to go by the book. If this is the sea goat you like, then this is the sea goat you should get! 14. A strong tattoo with strong lines. 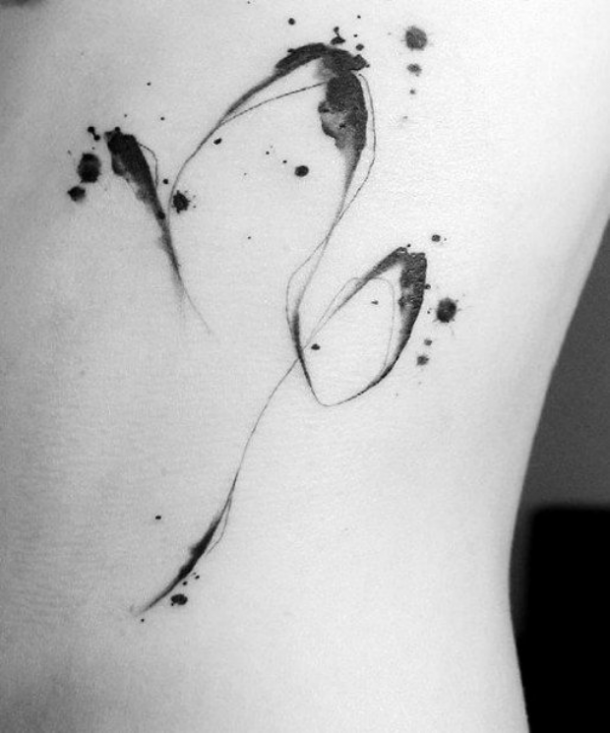 If you want your tattoo to stand out, you need to get something like this, with strong lines and a bold design. It's certainly classic, but it still demands to be seen. 15. 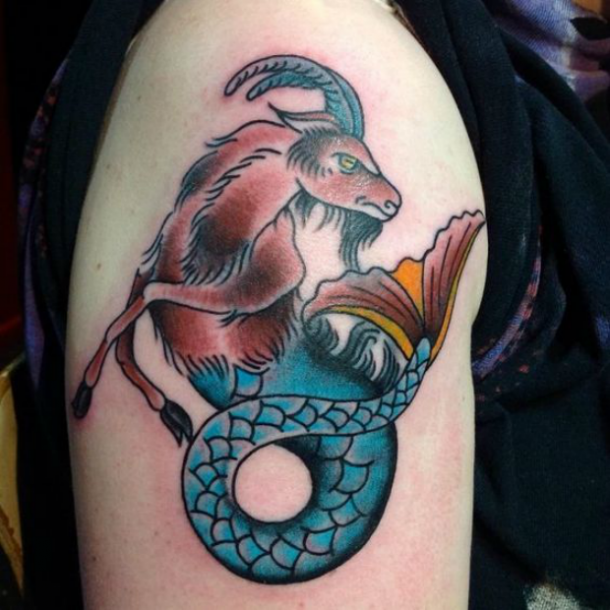 A Capricorn tattoo to show off. 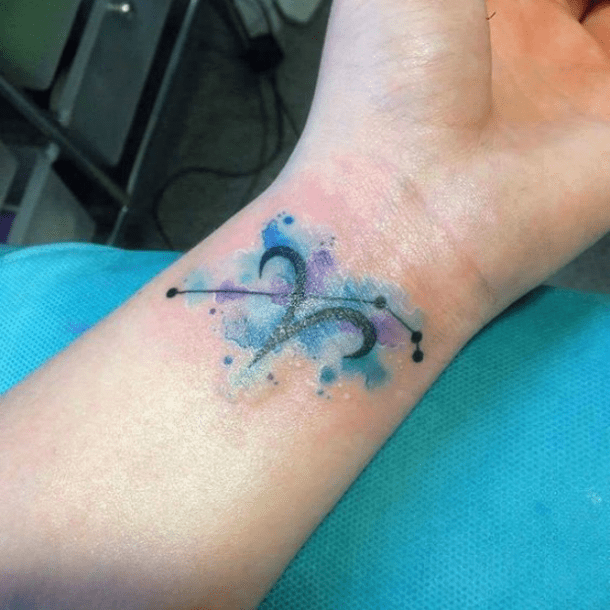 This tattoo is perfect for showing off, combining the zodiac symbol for the sign and a splash of watercolor, which you can do in any color that you like best! 16. A pretty constellation to brighten your day. The Capricorn constellation may be a simple one, but it's certainly still beautiful. Bring a splash of beauty to your constellation tattoo by replacing the stars with flowers that are always in bloom. 17. A bold and interesting tattoo. This tattoo is straightforward and interesting to look at — there's a lot of detail, but nothing to take away from the main subject. 18. 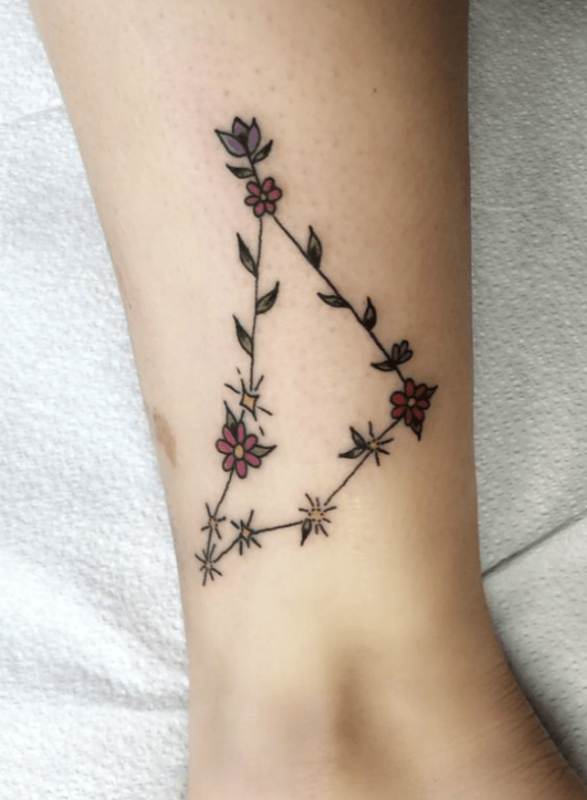 A dainty constellation tattoo for someone who wants to keep things pretty and subtle. This tattoo may be subtle, but it's definitely not boring. 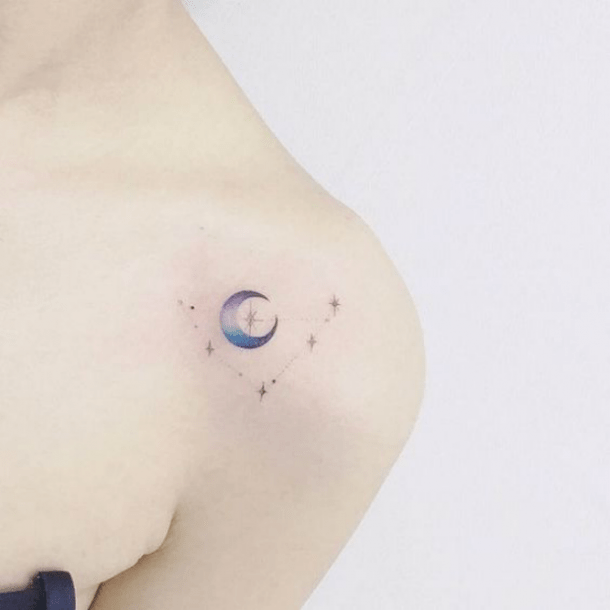 A crescent moon with the Capricorn constellation behind it is a dreamy and pretty tattoo — enough said! 19. Why not spruce up the Capricorn symbol?! Everyone loves flowers! But instead of exchanging the stars in a constellation tattoo with flowers, you can wrap some flowers around the Capricorn symbol and get the same effect. Pretty and unique! 20. Another realistic sea goat. 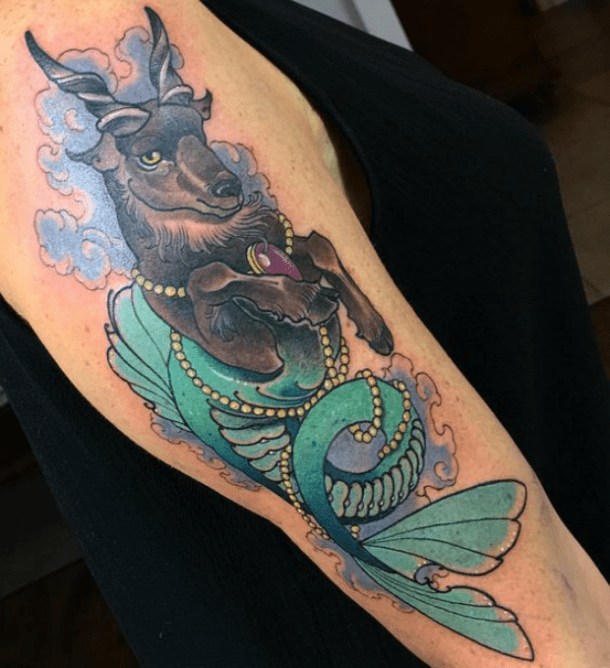 Here's another take on the realistic sea goat tattoo. 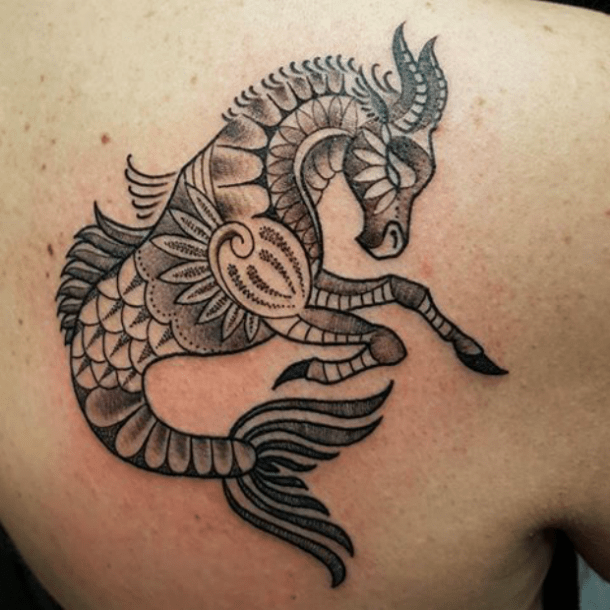 With pretty much every zodiac-inspired tattoo, you can put your own spin on the sea goat, making it as realistic or cartoon-like as you want. Make it your own! 21. This tattoo has a lot of different elements that all work really well together! If you didn't know already, each zodiac sign's constellation can be matched up to the animal that is associated with that zodiac sign. The Capricorn constellation lining up with the sea goat shows you just how that works. Add a crescent moon and some night sky, and you've got yourself a masterpiece! 22. Or add a splash of color! Here's another watercolor tattoo that looks like a little bit of color was splashed on your simple tattoo to make it vibrant and eye-catching. Stick with the purple and blue colors or go with something that represents you more. 23. As a Capricorn, you might want something a little more reserved (but not boring in the least). 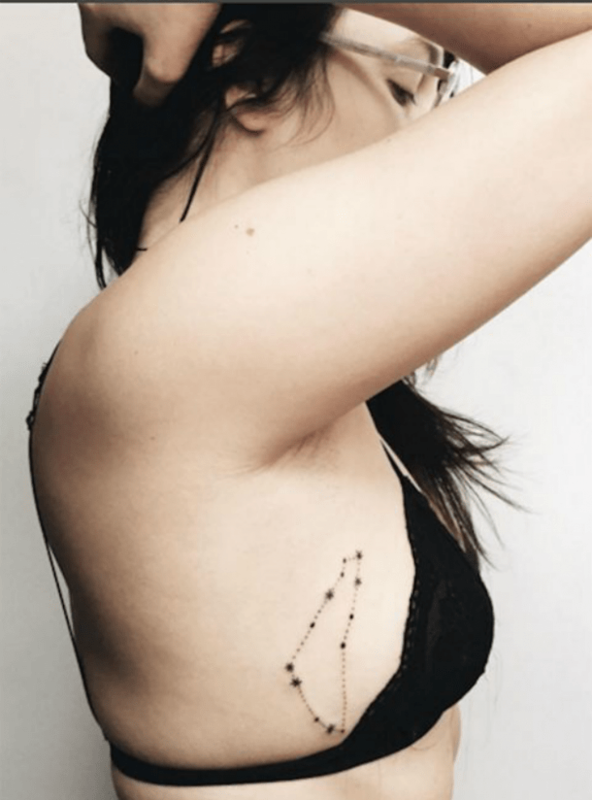 As a Capricorn, you might not want to get too crazy with your tattoo, but this constellation is anything but boring. You'll also love that you can hide it when you're at work, but still be able to show it off during the summer. How practical! 24. A back of the neck tattoo is always in style. This tattoo might not be as practical (especially if you like keeping your hair up, but it is always in style. You can always guarantee that this tattoo will bring compliments from all your friends and family when you show it off. 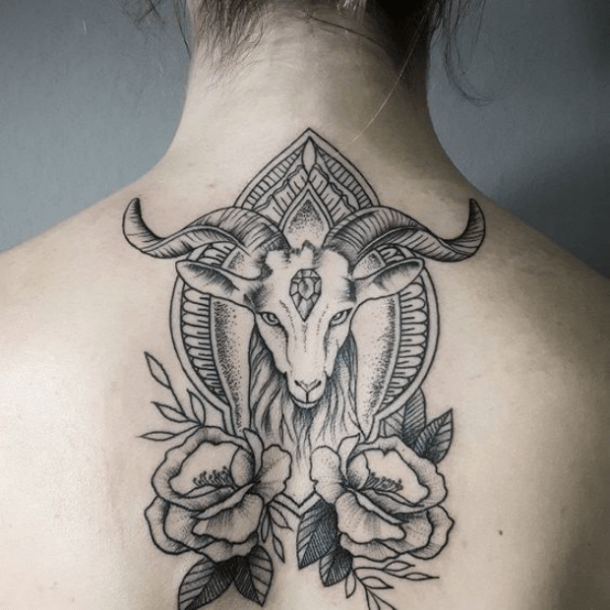 You can add flowers to pretty much any tattoo and it'll be breathtaking, but I especially love that this tattoo in particular is really brought together with the different flowers in the body and geometric shapes in the horns. Love this!